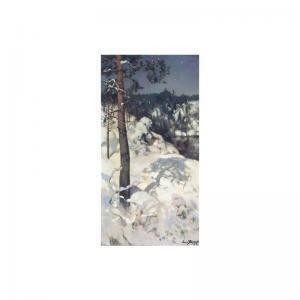 Find artworks, auction results, sale prices and pictures of Eero Jarnefelt at auctions worldwide. Eero Jarnefelt - View From Koli Inscribed "koli"
Objektsbeskrivning EERO JÄRNEFELT 1863-1937 View from Koli Inscribed "Koli", by the artist Authenticated on the reverse with a stamp of the artist´s deceased estate signed by Laura Järnefält 1904-1885), the artist´s daughter, and Ivar Hörhammer (1884-1953), the gallerist and artdealer. Charcoal and watercolour, 465 x 371 mm. Folded flaps, each 65 and 26 mm., on the two vertical sides The view is taken from Ukko-Koli, Mäkrä the most well-known vantage point in Koli with a grand view to the East over lake Pielinen (Pielisjärvi). The peak of the hill is situated 247 m. above the sea level and 243 m. above the lake. 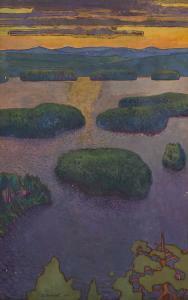 The vantagepoint is of national fame in Finland through Järnefelt´s picture "Autumn Landscape of Lake Pielisjärvi", from 1899 which was used for a National telegram which helped to define the national sense of landscape (Ateneum, Helsinki). Koli, since 1991 a National Park, is situated c. 500 km. northeast of Helsinki in Finnish North Karelia close to the border to Russia. Eero Järnefelt made his first trip to the area around Koli in 1892 together with the writer Juhano Aho (before 1908 Johannes Brofelt) and Aho´s wife, the painter Venny Solda-Brofelt on their journey to Finnish Karelia. Emerging towards the end of the 19th century, Karelianism was a trend inspired by Karelia and the ancient Finnish lifestyle. The quest for Finnish roots and the national identity under Russian rule took people to the areas rich in Karelian poetic and singing traditions. 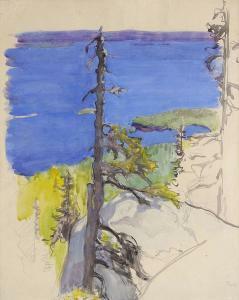 Soldan-Brofelt describes the landscape in her travel journal: "We stayed on the slope of Koli Hill for a while. The scenery was fabulous: the meadows, pastures, trails of smoke in the evening sun, the hills looming in the distance." Aho himself was inspired by Koli for his novel Panu, published in 1898, which describes the struggle between Paganism and Christianity in Finland. Järnefelt continued to visit the area regularly until 1936. In 1909 Järnefelt visited Koli together with his brother-in-law, the great Finnish composer Jean Sibelius. Sibelius´s fourth symphony, first perfomed in 1911, was partly inspired by his trip to Koli. Sibelius dedicated it to Järnefelt. Whilst at Koli Sibelius wrote in his diary: "Never have I felt as Finnish as in Vienna, Italy and Paris. Never have I felt as Parisian as on Lake Pielinen". Together with A.W. Finch and Ilmari Aalto, Järnefelt painted a large scene of Koli in 1911 for the restaurant of Helsinki railway station, perhaps as an hommage to Sibelius´s symphony. signed and dated 1895 l.r. oil on canvas this lot contains 1 item(s). 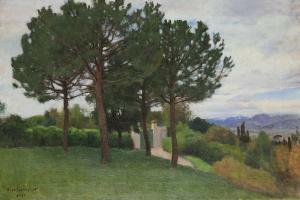 provenance:hjalmar andrée (by 1927); thence by descent to the previous owner sale: falkloos, malmö, 15 november 1997, lot 243 purchased at the above by the present owner eero järnefelt's depiction of nature was inspired by the plein-air realism that he encountered whilst in france and the work of his fellow countryman albert edelfelt. having studied at the academy of art in st. petersburg (1883-6) and at the academie julian in paris (1886-91), on his return to finland järnefelt's landscapes of the early 1890s reflected his renewed interest in the karelian movement. led by akseli gallen-kallela the karelianists were united in the belief that the ancient origins of finland's national epic, the kalevala, lay in the eastern part of finland. 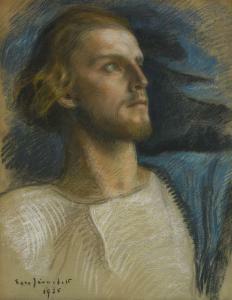 although there are traces in järnefelt's work of the national romanticism that would dominate finnish art in the latter part of the decade, and which asserted the independent spirit of the finnish nation, järnefelt shunned the more radical tendencies of this symbolist style. instead, as expressed in the calm mysticism of the present work, he championed the sense of the idyllic finnish landscape.